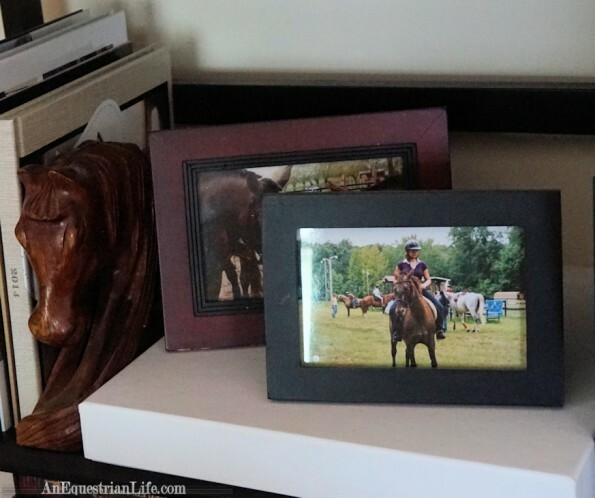 As would make sense, horse people collect horse decor. Why not be surrounded by things that remind you of the animal you love? 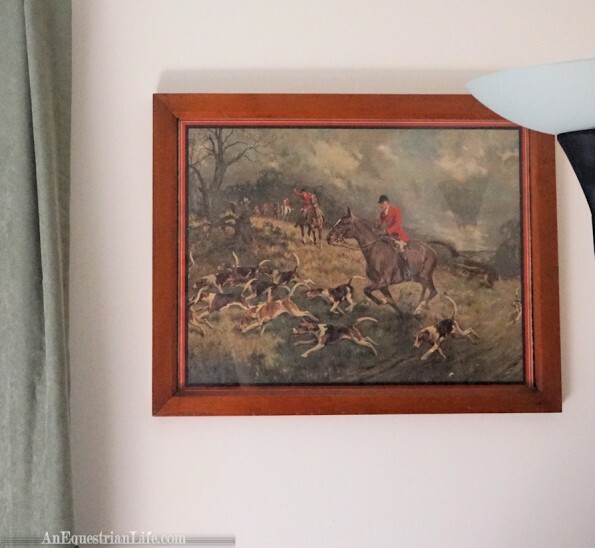 Sometimes, horse people are gifted terrible versions of horse decor, too, and then there’s the shame of trying to figure out if it should be displayed, and how long, and when can you get the monstrosity out of your house? Luckily, much nicer horse decor exists, and sometimes we stumble upon it. I’ve stumbled upon a few things that I really like, and I wanted to share them. This giant canvas is on my office wall. I like that it’s giant, and you can see it all the way from my front door, even framed by a doorway (sort of visible in the next photo.) A friend found this at a high end mall in one of the furniture stores. It was with several others like it, but for unknown reasons, this one was half off. We searched, and there is no visible blemish anywhere on this thing, so the only conclusion I have is that it has an ancient voodoo curse on it. This is emphasized by Dave disliking this painting. He complained about it for months after we got it, saying it looks like a skeleton horse. It took a few years, but he’s finally stopped telling me and everyone else how much he hates it. This is my living room wall, looking towards my office (in case it wasn’t obvious from the visible painting.) Here is a photo I took while riding Vintage. It’s from when I lived with my parents, and it had just snowed. I really like the photo because without editing it, Vintage matched the colors of the background. I had it printed on a canvas, but unfortunately, I didn’t get it cropped to fit any standard size. I also didn’t feel like getting a custom frame, so I just put it in this one. Lesson learn — make sure photos are a standard size before printing. I’m sure everyone has lots of framed photos of themselves. These two are me riding Vintage in the first year of owning her, and behind it, is Vintage touching noses with another horse at a show. The other horse is visible at this angle, Vintage is not. 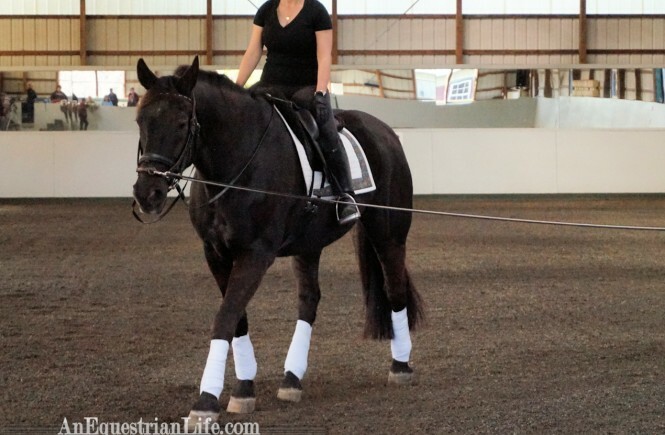 They looked similar though, it was a nice shot taken by one of the lesson moms. But, what I actually wanted to show was the wooden horse sculpture. We got it in Bermuda at a street vendor. A lot of those places are junky touristy crap (like the straw market), but I was impressed by this one, as the guy was sitting there carving away while tending his tent. So we got it for about $10 (I think). It now holds up our photo albums. We got this painting at Lowes, the home improvement store. It was in the boxes of pre-farmed paintings near plumbing. It was a spur of the moment buy, and I don’t know where to hang it. Sometimes I put it on top of a bookshelf, but it eventually makes a dive for the floor. One day I’ll figure out where I want it. On the subject of more paintings I don’t know where to hang, is this one. It is huge. I placed Poffins next to it to try to show the scale of it. It mostly just sits on the floor of my unused room, trying to guilt me into hanging it someplace. It’s the only original painting that I own. I saw this painting at a local high-end tack store. It was hanging on their wall. You know those moments you sometimes get that just make you feel all smug, like this is the moment you made it? That’s how I felt when we called over the owner and asked how much to buy the painting off of their wall. Sidenote: If you asked me now if I’d rather have the cash or the painting, I’d say the cash. Especially since this painting currently decorates the area where my dogs keep their toys. The horse is a metal picture that was given to me by my mother-in-law. I was actually shocked that she found a realistic looking, non-creepy picture of a horse to give me. She might not have realized how impeccable that gray horse looks, but she did great with this. I managed to get a big scratch on it when we moved, but I still like it. Below it, while not a horse, is another picture I took. My beloved chicken Spoof, staring intently at our deck. She’s staring intently at clouds with angels now. 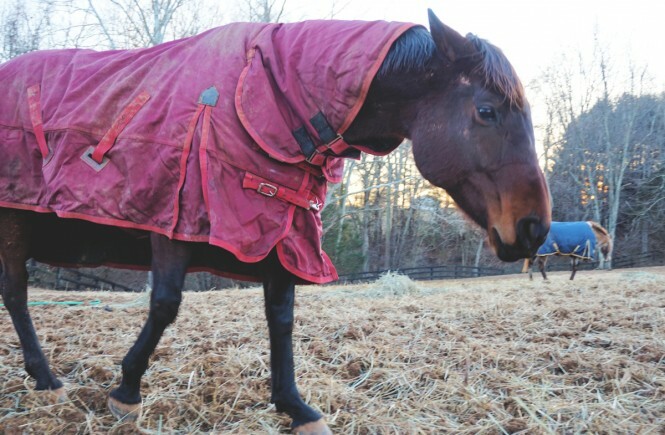 As proof that the first horse was a lucky fluke, here is my mother-in-law’s second gift to us. Also made of metal, but with a much more terrifying edge. It looks like a T-rex with those tiny upper arms. This hangs right above my computer, so I can stare at it when I’m deep in thought. There’s nothing like a malformed metal horse (which I imagine shooting fire and making noises like the dinosaurs in Jurassic Park) to get the creative juices going. A friend found this for me in an antiques shop. 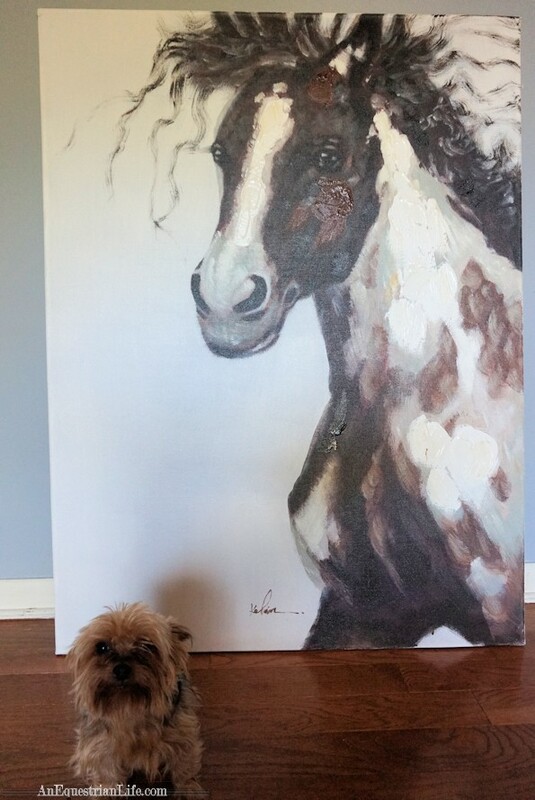 She’s a horse person too, and has her own collection of antique horse paintings. This one is in my guest room, which inspired a slight theme. 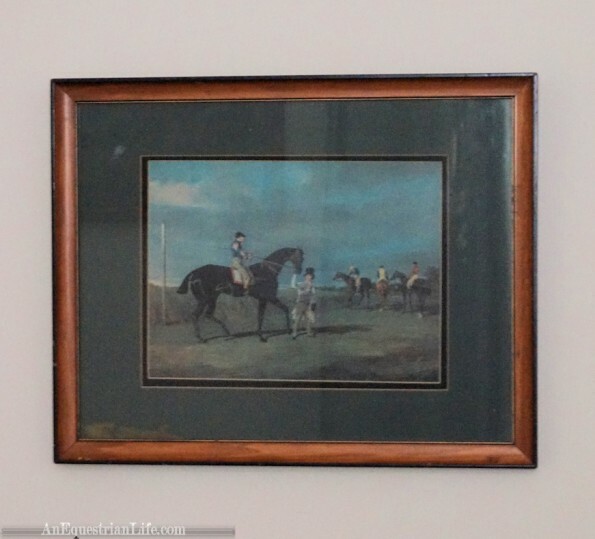 The “old horse painting” guest room theme continues and ends with this painting. Dave found this one at ReStore, which is a store that sells lots of construction and renovation supplies at low prices. It’s mostly donated to them, so it’s a huge mishmash of all sorts of out of date appliances and colors. If you were wondering where to find a 60’s style pink bathtub, you should probably check the ReStore. My ReStore has furniture and decor there, which is where Dave found this. He also purchased two copies of the exact same flower painting, but that’s neither here nor there. 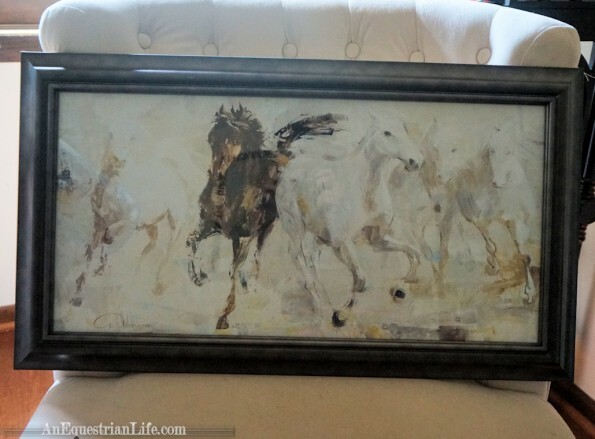 This horse painting was a great find, and I love it. 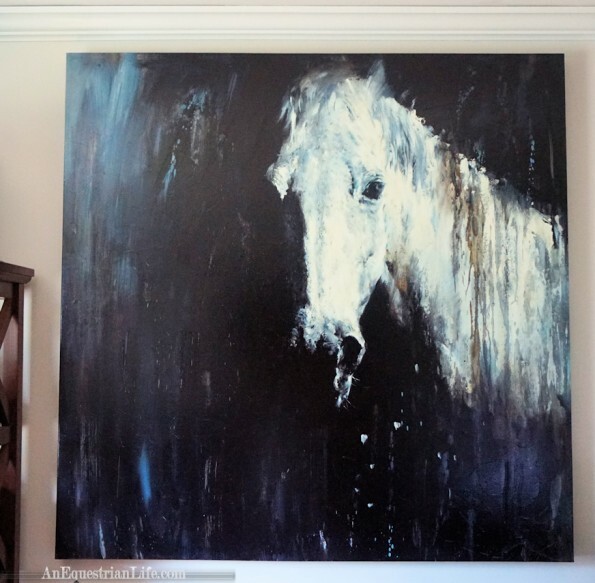 One day, I’ll draw more inspiration from my guest room horse paintings and finish decorating the room. That’s basically all the horse decor I have in my house. 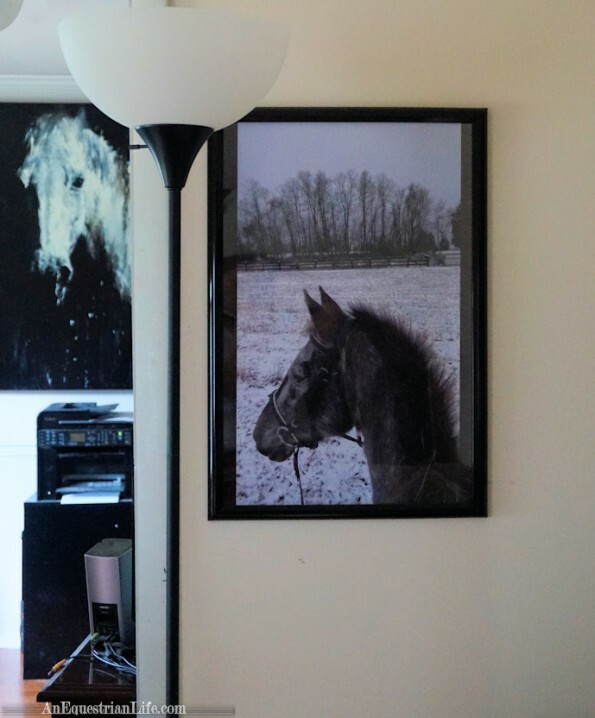 I don’t want to go overboard, but I’m hoping to find more ways to subtly incorporate my love of horses into the decor. I’m not really into rainbows, glitter and unicorns, but perhaps natural colors, more wooden sculptures, and refined colors. More hunt box than old west. We’ll see… If I make any progress, I’ll be sure to post it. I should do a similar post as my house is crawling with horse stuff. I also have a bunch of un-hung stuff hanging out. 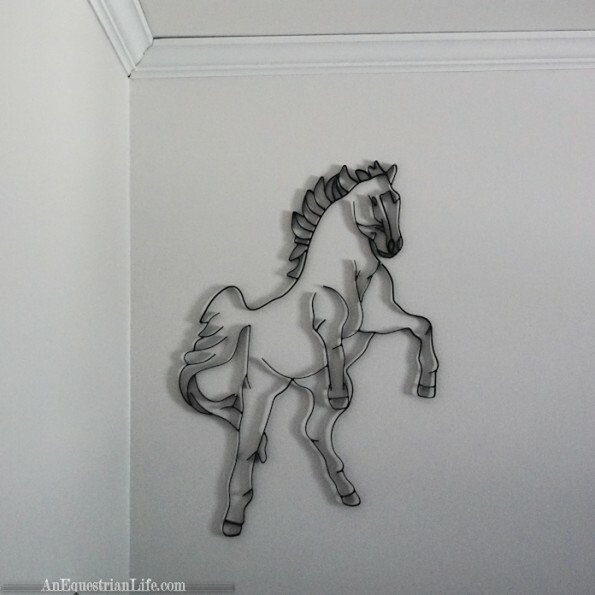 I have a weird aversion to horse-themed decor in my house. Maybe it reminds me of when I was a kid and covered all my books with horse collages. 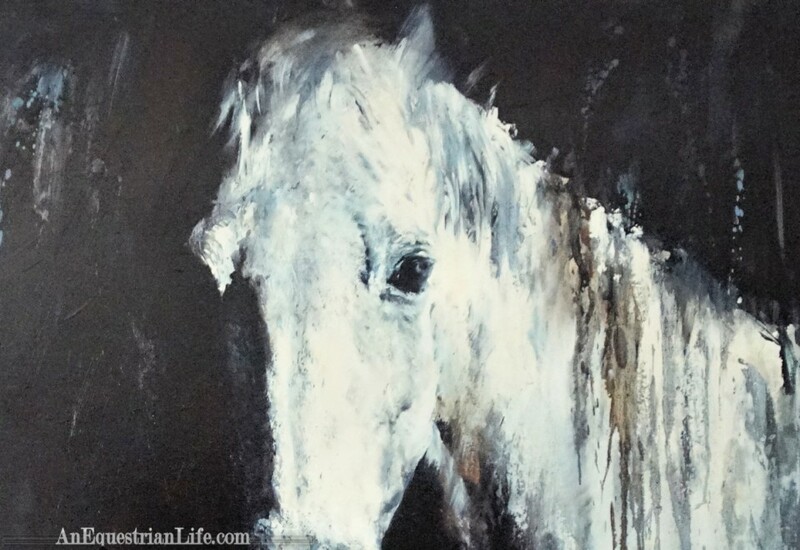 I was so horseless and desperate and now I much prefer going out to see the real thing. Sounds like a perfect place to keep your saddle. Admire it when not in use! 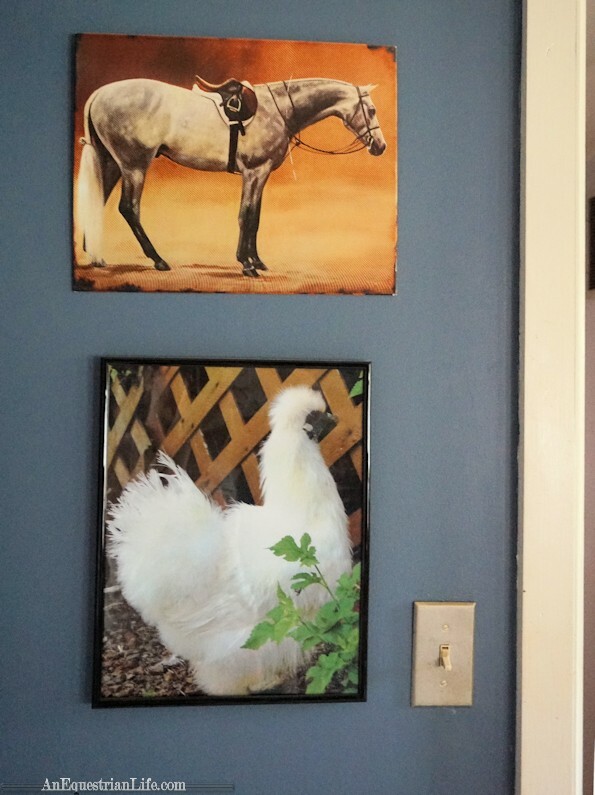 I have been gifted with the terrible horse related art before, but luckily no one comes to my house and I hang pretty horse pictures instead!